Type the Term you'd like to search for. Firms that ensure that the title to a piece of property is clear and provide title insurance. 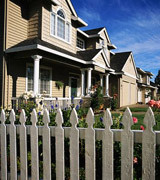 A policy issued to lenders and buyers to protect any losses because of a dispute over the ownership of a piece of property. A check of public title records to ascertain that the seller is the legal owner and that there are no claims or liens against the property. A real state industry term that refers to agents and brokers who sell a high volume of homes. Another term for a production home, a mass-produced house constructed by one builder in a project. Other real estate or assets a buyer gives to a seller as part of the down payment. A reference to buyers who purchase a home that is less expensive than their current house. A reference to buyers who purchase a home that is more expensive home than their current house. Trans-Union Corp. is one of the "Big Three" credit-reporting bureaus that operate nationwide. Address: 760 Sproul Road, P.O. Box 390, Springfield, PA 19064-0390. Phone: (312) 408-1400. Securities issued by the Treasury Department that have the full backing of the U.S. government. Special accounts used by brokers and escrow agents to safeguard funds for a buyer or seller.